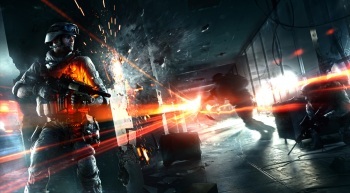 Not one, not two, but three Battlefield 3 expansions will roll out over 2012. Battlefield 3 fans have a lot to look forward to in 2012, with three big, themed expansion packs set for release over the next several months. First up is Close Quarters, a "frantic, infantry-only" battle featuring tight, destructible levels, vertical gameplay and new weapons, assignments and unique dog tags. Next is Armored Kill, with new drivable tanks, ATVs, mobile artillery and other vehicles, plus huge battlefields including the biggest map in Battlefield history. And finally there's End Game, but details on that are being kept very hush-hush for the moment. "Instead of delivering piecemeal map packs, we're giving players a completely new experience with every themed expansion pack to keep the action fresh," said Executive Producer Patrick Bach. "Our expansions are designed to excite our large and active fan base while attracting new recruits with gameplay that is dynamic and unpredictable every time." Prices haven't been announced but the expansion extravaganza will begin with Close Quarters in June, followed by Armored Kill in the fall and End Game in winter. A closer look at what's in store in Close Quarters is up now at battlefield.com.